Thanks to rigorous planning and widespread use of best practices, Eaton’s two new data centers will deliver a projected $23 million in energy savings while supporting power densities of up to 180 watts per square foot. 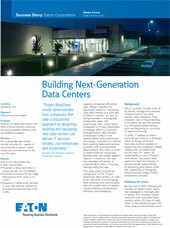 Helping companies plan, design and operate sustainable data centers is a core part of Eaton’s mission. Not surprisingly, then, when the company set out to construct two new data centers of its own, it employed today’s most sophisticated tools, techniques and design methods in a manner that carefully balanced business priorities with environmental responsibility. What resulted are two LEED Gold certified computing facilities that will reliably and efficiently support Eaton’s IT needs for the next two decades while minimizing the company’s carbon footprint.